And folks in the Philippines are saying, "Goodbye, good riddance, and don't come back!" TAU 120. MAXIMUM SIGNIFICANT WAVE HEIGHT AT 090000Z IS 12 FEET. NEXT WARNINGS AT 090900Z, 091500Z, 092100Z AND 100300Z. More than 90 people have been killed by flooding and landslides triggered by heavy rain in the northern Philippines, reports say. Local officials said at least 69 people were killed in Benguet province alone. The country is still dealing with the devastating aftermath of Typhoons Ketsana and Parma. There were reports that some of the latest landslides were caused by water that was released from dams in the wake of Typhoon Parma. Typhoon Ketsana left at least 300 people dead and hundreds of thousands stranded, while Typhoon Parma caused further damage just over a week later. Benguet provincial governor Nestor Fongwan told the AFP news agency that 69 people in the province had been killed across five districts. Another 17 people were reported to have died in the city of Baguio and several more fatalities occurred in Mountain province. "The rains in this area are unprecedented," said Glen Rabonza, executive officer of the National Disaster Coordinating Council (NDCC). "We are stretched, no doubt, but we are responding in the best way we can," he told AFP. The NDCC said thousands of people had been stranded on rooftops and on higher ground. The provincial governor of Pangasinan province, Amado Espino, told reporters that water released by the San Roque dam had flooded towns. "The dam is supposed to be for flood control but now it is so filled it is like it is not there. The water just rushes right through from the mountains to Pangasinan." Mr Espino said strong currents and continuing rain were making it hard to reach and rescue people in flooded areas. The province's Vice Governor, Marlyn Premicias, told the Associated Press she had been receiving text messages from people needing to be rescued. "Eastern Pangasinan has become one big river," she said. Lt Col Ernesto Torres of the NDCC told Reuters news agency that 30,000 people had been evacuated in the province and 60-80% of the land was flooded. The UN earlier appealed for $74m (£47m) to help victims of storms in the Philippines. It says about 500,000 people have fled their homes and are still living in emergency shelters and has warned of an urgent need for food, water, sanitation facilities, emergency shelter and health care provisions. Typhoon Ketsana hit Manila and surrounding areas on 26 September, causing the worst flooding in the capital in more than four decades. Eight days later, Parma blew across the country's mountainous north, bringing more rain. Meteorologists say the storm is still lingering off the coast of the Philippines. Have you been affected by the landslides in northern Philippines? Send us your comments, pictures and videos. Send your pictures to yourpics@bbc.co.uk, text them to 61124 or you have a large file you can upload here . 091500Z POSITION NEAR 17.4N 118.7E. 12 FEET. NEXT WARNINGS AT 092100Z, 100300Z, 100900Z AND 101500Z. 2. 12 HOUR SUMMARY AND ANALYSIS. CONSENSUS THROUGH TAU 48. SIGNIFICANT INTENSIFICATION IS NOT EXPECTED EITHER DUE TO MARGINAL UPPER LEVEL CONDITIONS AND A DRAMATIC DROP IN OCEAN HEAT CONTENT NEAR TAU 48. THE RIDGE TO THE NORTH WILL ALSO PROHIBIT POLEWARD OUTFLOW, WHICH WOULD BE NECESSARY FOR A STRONGER SYSTEM TO SUSTAIN ITSELF. VERTICAL WIND SHEAR MAY RELAX OVER THE NEXT DAY OR 2, AS SOME OF THE MODEL FIELDS SUGGEST, ALLOWING FOR SLIGHT INTENSIFICATION PRIOR TO ENCOUNTERING DECREASED OCEANIC HEAT. DRAMATIC DROP IN OCEAN HEAT CONTENT?!! I've attached two charts showing SSTs in the area. Obviously there is no significant drop in the sea surface temps there. Now I know they said "ocean heat content", and so far I have not been able to find a current OHC chart for this area that shows the 20C isotherm down to 100 meters and that's what I'd really like to see. But still, I'm confused. Are they referring to upwelling? If they are, the core of PARMA's circulation never sat over the area it is over now, and the current surface SST numbers would never read 28 or 29C if PARMA had sucked thermal energy out of that area. So what are they talking about? Does anybody know? Unless I'm missing something, I'm really disappointed they put that in there. ozonepete wrote: DRAMATIC DROP IN OCEAN HEAT CONTENT?!! I've attached two charts showing SSTs in the area. 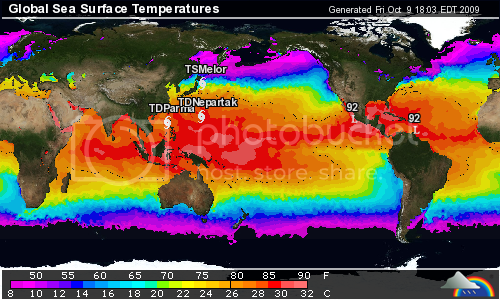 Obviously there is no significant drop in the sea surface temps there. Now I know they said "ocean heat content", and so far I have not been able to find a current OHC chart for this area that shows the 20C isotherm down to 100 meters and that's what I'd really like to see. But still, I'm confused. Are they referring to upwelling? If they are, the core of PARMA's circulation never sat over the area it is over now, and the current surface SST numbers would never read 28 or 29C if PARMA had sucked thermal energy out of that area. So what are they talking about? Does anybody know? Unless I'm missing something, I'm really disappointed they put that in there. It might not be dramatic, but there is a drop. I'm wary of the forecast for different reasons: ocean heat content is not a big player on a moderate to fast moving weak TS. Maybe a slower mover, or something that will have a little more Eckman pumping like a typhoon. I think for the weaker systems, SST is all you need to worry about. I do, however, agree with the intensity forecast for other reasons. The TEJ is still in the area and shear will slowly increase the further west it goes. (Granted, I said the same about Ketsana, and it ended up being a typhoon). PANGASINAN, Philippines -The death toll from two weeks of unprecedented storms across the northern Philippines soared past 540 on Friday after landslides consumed homes and neck-deep floods inundated towns. At least 181 people were killed in a series of rain-triggered landslides overnight Thursday and on Friday in the Cordillera region, local officials reported. Meanwhile, the downstream farming plains of Central Luzon were inundated with waters that reached two storeys high after dams in the mountains could not hold the phenomenal amount of water that has fallen on the region. "The rains in this area are unprecedented," the executive officer of the National Disaster Coordinating Council, Glenn Rabonza, told Agence France-Presse. "We are stretched, no doubt, but we are responding in the best way we can." 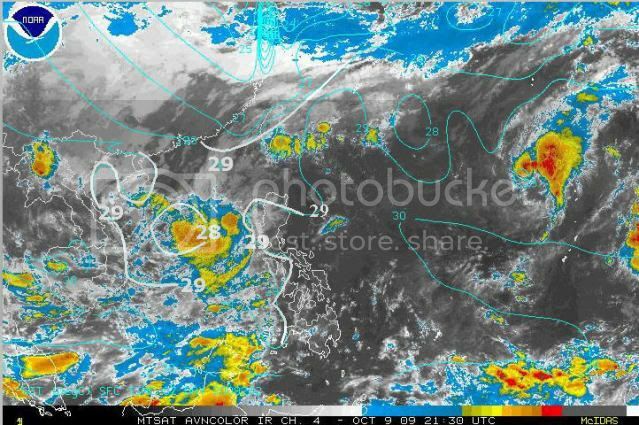 The crisis showed no signs of easing as tropical storm Pepeng (international codename: Parma), responsible for the past week of rains, continued to hover just off Luzon. In Metro Manila, nearly 300,000 homeless survivors from Tropical Storm Ondoy (Ketsana) were packed into evacuation camps following record rains on September 26 that killed at least 337 people. US troops helping out in the capital extended their relief work to the north on Friday, dispatching helicopters and other rescue equipment, the Filipino military said. The US embassy announced an extra two million dollars in aid for the Parma victims on top of money and materials donated for the Ondoy operations, while UN humanitarian chief John Holmes is to begin a two-day visit to the country Monday to review relief efforts, the world body said. The worst of the overnight landslides appeared to be in remote Benguet province, where 120 people were confirmed killed in five towns, said provincial governor Nestor Fongwan. Another 38 people were confirmed killed in the neighboring mountain resort of Baguio, officials there said. Across all of the north, the confirmed death toll from the landslides was 181, on top of the 25 people killed earlier by Pepeng. In the farming region of Pangasinan province to the southwest of the provinces where the landslides occurred, thousands of people were stranded on rooftops in dangerously similar scenes to those in Manila a fortnight ago. "A lot of places cannot be reached by our rubber boats because the current is too strong due to the waters released by San Roque dam," Pangasinan governor Amado Espino said. The disaster council's Rabonza said about 60 percent of Pangasinan, including about 30 towns, were flooded with waters reaching as high as the second floor of buildings. 101500Z POSITION NEAR 18.4N 116.2E. theavocado wrote: It might not be dramatic, but there is a drop. I'm wary of the forecast for different reasons: ocean heat content is not a big player on a moderate to fast moving weak TS. Maybe a slower mover, or something that will have a little more Eckman pumping like a typhoon. I think for the weaker systems, SST is all you need to worry about. Thanks for the info. That's the way I've always understood it - OHC only comes into play after the TS stage, since you need a strong storm to tap into a deep heat source. BTW, where did you get that chart? That's exactly what I was looking for. Thanks again. P.S. And nice call on Parma. Even though some impressive convection is firing again, the shear is killing it right now. Last edited by ozonepete on Sat Oct 10, 2009 7:01 pm, edited 1 time in total. I agree, Hurakan. Convection getting over LLC more. Boy, this storm won't quit!